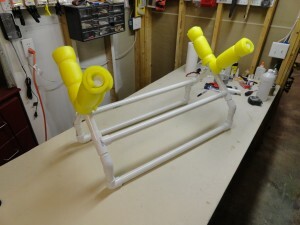 Check out my instructions for making a PVC airplane stand here. It's cheap and works well at home or at the field. Though I don't think I'll need on for my Bixler. I'll just put a hook on it and hang it on the wall! Yeah you don't need too much for a Bixler. 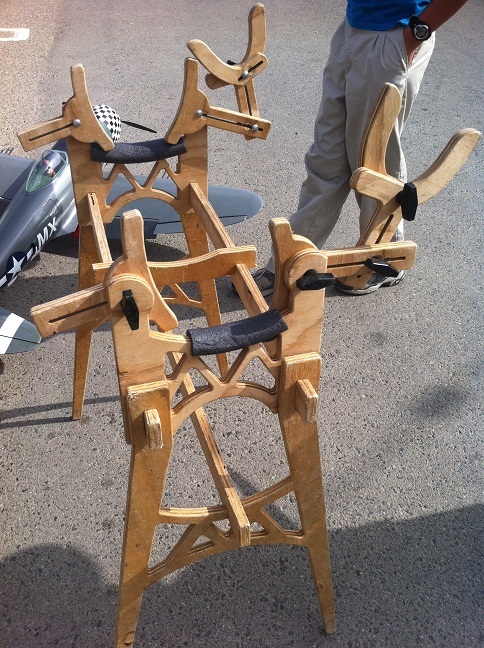 But they are cheap and convenient when you have planes you need to attach wings or work on upside down. In fact I used one to transport my giant scale P-47 to and from the field. Yes, of course, I understand they are very useful for fuel airplanes and large foamies. A friend of mine has made one for his Hangar 9 Tango. The picture only shows half of it, but you get the idea. It holds the fuse and the wing, and fits perfectly in his car. Yeah that's the great thing about PVC. With all the different connectors you can build just about any custom design you need and it's cheap. It's a great way to keep things safe. One of the guys from our field made this. Holy Flying Cow! What size airplane is that for?